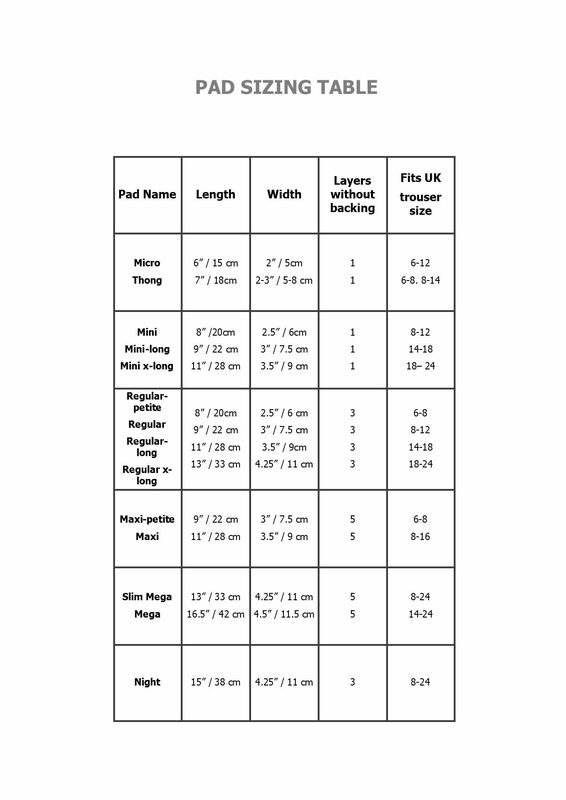 The HYF pad sizing table will help you get the pads you need. 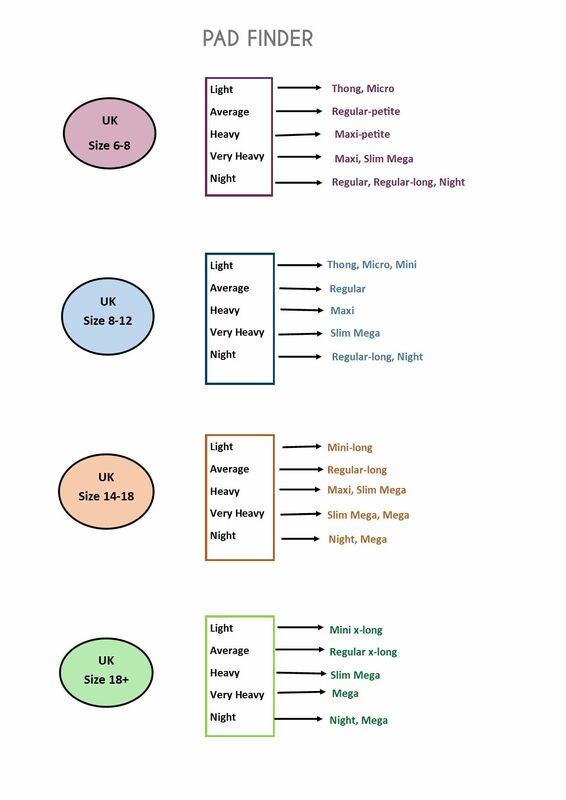 If you don't know where to start, then measure your current pads, and choose something the same length. Micro pads and Thong Liners- will be great for everyday freshness all day, menstrual cup backup, ovulation days. Mini pads - will take spotting for up to a whole day. Also happy with that dark gloopy gungy flow at the start and end of a period (sorry for graphical descriptions!) Like the Micros and Thongs, good for everyday freshness and ovulation (white gunge) days. Slim Mega pads - will take more flow than a Maxi, simply because there is more fabric there. Mega pads - are for those of us who don't believe there is a pad on this planet which can cope with their flow! They can cope with a really heavy flow for up to 3 hours. Basically, the more fabric there is, the more absorbent the pad. All our reusable menstrual products are made to a high standard of love and care in the UK. They are made individually by hand, and sometimes carry the quirks of uniqueness! But they are all top quality and beautiful, made with only the best fabrics. The price reflects the quality. Your HYF washable pads should last you many years. If they don't, then we would like to know about it. We hope you enjoy using them as you honour your own flow. All the fabrics that Honour Your Flow cloth menstrual products are made from are the best quality we can find. Our pads are made from organic cotton top and inner layers, and the wool we use is USA produced GOTS certified organic. We believe natural fabrics are very important, as they make wearing your washable menstrual products cool and comfortable, with none of the unpleasant symptoms that have been associated with disposables. You don't get burning, itching or thrush symptoms during your period when you use natural fabrics. 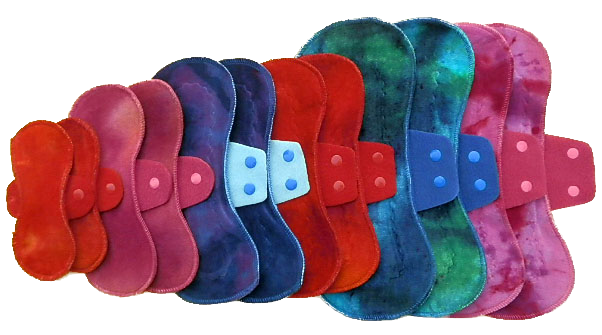 Some women (enough to take notice of) report lighter bleeding and less pain when they use cloth menstrual pads. Why the polyester fleece? - well because it does a great job of holding moisture in the pads. It's not organic or even natural, but it is breathable. It is what we call moisture resistant. This means it will leak if you wring it out or squeeze it hard, but otherwise it keeps blood inside the body of the pad. What is PUL anyway? - it's PolyUrethane Laminated onto polyester. It's what they use for nappy wraps, and it is very waterproof! Wool is delightful and totally breathable and lovely. It will suit you for many hours at a time if you have a steady flow, but if you have sudden heavy splurges, then perhaps fleece pads with a PUL layer is your answer. PUL (Poly Urethane laminate) is a breathable yet totally waterproof fabric, widely used in cloth nappies. Having said that, wool backed pads can cope with heavy flow, for a shorter time. One more thing to remember is that wool does have that magic quality of allowing moisture to evaporate off it, so your pad does actually relieve itself of some of the liquid. Pads with PUL in cannot do this. All Honour Your Flow pads are pre-washed and ready to use. You should wash them with dark colours for the first few washes in case the dye runs a little. When you do wash them, as far as the fabrics are concerned, they can all be washed up to 60', although the PUL in the Maxis, Megas and Nights would prefer 40', which is also a more environmentally friendly temperature. Personally I have washed mine at all different temperatures to see what happens, and to be honest, I don't see much difference between washing at 30', 40' and 60'. But there is something else you should know about washing cloth menstrual pads, and that is the nature of heating blood. As blood is a protein, it can set with heating (like the white of an egg when you cook it), so there is actually a scientific reason to wash low rather than high. Never use fabric conditioners on your cloth pads! They reduce the absorbency of cloth pads. Washing your cloth tampons - You will need to wash your tampons before first use. They are perfectly happy at 60'. In terms of washing powders, I would recommend an Eco powder like Bio-D or Ecover or even Soap Nuts, as these won't contain the harsh chemicals that some of the main stream powders contain. Because they are worn internally you do need to consider what you might be absorbing. Remember - you don't have to buy a whole load of pads today! (Tempting though it may be) You can try one or two now, and once you know which you like best and which thickness, then build up your stash. Also, some women find that their flow gets lighter when they switch to cloth, so I think it’s best to buy a few pads at first, and come back for more next month. Many women buy a few at a time, integrating them in with disposables, until they have enough to use all cloth menstrual pads. How to wear your pads - The most important thing to success in wearing your washable menstrual pads is Snug Fitting Knickers! The pads popper into your knickers, and if your knickers are snug, they don't move. If your knickers are too loose then the pads may slip about. Honour Your Flow cloth pads come in different widths, so it's best to bear this in mind. For instance, a 2" wide Mini pad will not sit right in knickers with a very wide 4" gusset. Consider investing in some 'period knickers' which you know are a good snug fit and have the gusset width that fits the size of pad you like best. Do They Smell? – Lots of people ask this question when they are new to cloth pads. The answer is, NO, they don’t smell. You can even store them (dry) for 2-3 weeks in a wash bag, and they still don’t smell. When You’re Out and About – Take your clean pad out in a Carry Pouch or Moon Purse, and put your used put in it to bring it home. It won’t leak or smell in your bag, and no one need know it is there. 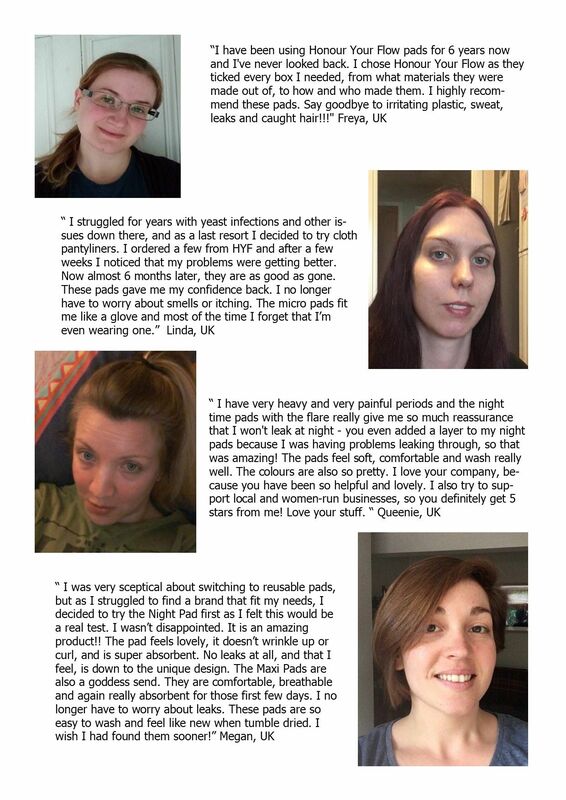 There are lots of customer reviews on the product pages of the website, but here are some examples of the kind of general comments that we get every week. If you want to return any of our products you are welcome to do so - within 14 days of receiving them please. Products must be in unused condition. If you have a faulty product (does happen from time to time unfortunately), then please contact me, and I will do my utmost to make things good for you.